The Fine Arts Department seeks to help students find their strengths and to foster all students’ creative and artistic instincts. Covering three curricular departments – Art, Music, and Drama/Broadcasting – along with a wide range of extra-curricular programs, Fine Arts provides each student a unique opportunity to develop creativity and purpose. 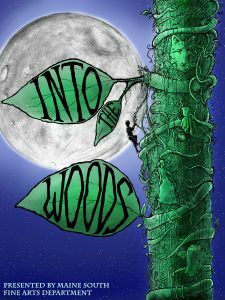 INTO THE WOODS is a modern twist on the beloved Brothers Grimm fairy tales in a musical format that follows the classic tales of Cinderella, Little Red Riding Hood, Jack & the Beanstalk and Rapunzel – all tied together by an original story involving a baker, his wife, and their wish to begin a family and . . .
Be a “Patron” and lend your support to our students and community by increasing the resources available to our Fine Arts programs here at Maine South and give all our students an outlet for creative self expression! Patrons of “The Arts” is based solely on donations which are used to enhance the Maine South education by providing guest artist-in-residencies and valuable workshops for students in all areas in “The Arts”. We hope you share our commitment to expand the talent pool available to the Maine South Fine Arts students by becoming a member of the Patrons of “The Arts” and donating to this valuable, philanthropic organization. The Maine South Music Booster Organization is parent run and a wonderful way to support the music programs at Maine South. Through Boosters, the students in Orchestra, Choir, Band, Piano, and Guitar are eligible to apply for scholarships for private lessons, summer camps, and college. During the 2016-2017 school year, Boosters provided over 600 private music lessons, and awarded 8 summer camp scholarships and 14 senior scholarships. In addition, Music Boosters provided two meals to each of the over 200 students who participated in the Washington, D.C. trip, along with contributing to both the new in class sound systems and the upcoming new auditorium sound system. Boosters also provide financial and hands-on help with concerts, equipment, guest musician clinics, travel experiences, snacks/meals, uniforms, etc., and respond to various requests from teachers throughout the year. Please join The Maine South Music Booster Organization and consider volunteering to support the fantastic music programs at Maine South. Attend our quarterly meetings, follow us on Facebook at www.facebook.com/MusicBoosters and check out our website at www.mainesouthmusicboosters.org to keep apprised of all the happenings and how you can be involved. We are recognized as a 501(c)(3) tax exempt organization, so your membership and any contributions are tax deductible. The mission of the Speech, Drama & Broadcasting Boosters organization of Maine South High School is to support the students participating in these three programs, both in the classroom and as extracurricular activities. Our primary focus is to raise funds and offer scholarships to graduating seniors. In the past three years we have distributed over $35,000 in scholarships. The SDB Boosters support and assist the faculty, the Fine Arts Administration, and the students involved in speech, drama and broadcasting. The Drama Department produces a number of shows throughout the year. A large part of our fundraising is through raffles, concessions, and flower sales at these performances. TLC dinners are served during tech rehearsals to everyone involved with the production of the fall and winter plays and the musical. The Boosters also support drama at Maine South by hosting receptions during special performances and recognition ceremonies, and assisting the International Thespian Society Troupe with their fundraisers. The Broadcasting program includes both radio and television experience for students. Funds donated to SDB Boosters have enabled us to assist with updating broadcasting equipment, to host an end-of-the-year reception celebrating excellent work and festival awards, and to provide other support of these students’ activities. Please consider joining Speech, Drama & Broadcasting Boosters. As an added incentive, your membership will enable you to enjoy the benefit of purchasing pre-sale tickets to the Spring Musical. Our meetings are open to all members and are held five times a year. We can always use help with TLC dinners, concessions, and flower sales at performances and many of us really enjoy getting to know each other by working together in support of our children’s creative endeavors. Please join, even if you are not available to volunteer. Though most of our members are parents of current students, some SDB Boosters are alumni families or friends from the community who wish to support arts education at Maine South, and we are so grateful to them. We depend on and truly appreciate any donations of time and/or your financial support of the Speech, Drama & Broadcasting Booster programs! click HERE for a printable SDB Booster membership form.